This weekend in Edmonton, I went looking for a few geocaches. 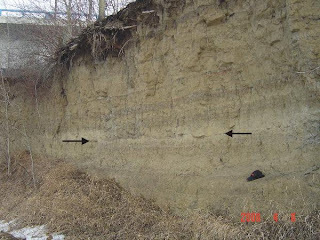 This one is on the banks of the North Saskatchewan River, and shows the Mazama Ash layer. Mt Mazama erupted around 6800 years ago in southern Oregon, leaving Crater Lake. Its ash plume extended to Alberta, and is a handy reference for geologists trying to date sedimentary layers throughout the Pacific Northwest. Shamefully, I neglected to bring my camera on this trip, so this picture is stolen from the geocache page.